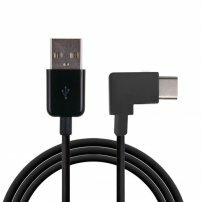 2 Meter / 6 feet USB Type-A to 90 degee L-Shaped Right-Angled USB Type-C Extension Cable [USB005791] : Onchee.com - the accessory shop for all your handheld Electronics! Make the most of every inch of your workspace! This USB cable features a handy, for tight spaces where a straight USB connector would not fit. This cable includes nikel-plated connectors for superior conductivity and fast, error-free data transmission. Unlike other cables, this cable is manufactured to exacting specifications, using superior materials, for a different experience. The angled (right-angled / left-angled) USB connector positions the cable in such a way that it allows you to easily access your mobile digital device in both portrait and landscape mode, even while charging. - The USB-A connector is a USB 2.0. - Dimensions / Length: 200cm (or 6 feet) approx. - Net Weight: 37g approx. Soft Silicone English Layout Keyboard Cover for MacBook Pro 13" 15" 17" / iMac / MacBook Air 13"